The trade session at GBBF, the day after the guild get-together, was preceded by a morning judging golden ales for Champion Beer of Britain. 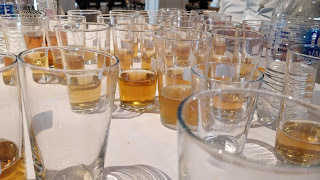 The tasting is all done "blind", but we find out later what we judged, so I can tell you that Salopian's Oracle was totally justified as the gold medal winner for the category! In the main halls downstairs afterwards, the beers were in good condition, better than in some previous years. Some were a little 'green' but this was the very first session, and from what I hear they improved just as you'd expect as the week went on. I only tried a few of these, but two in particular were very memorable – the dry-hopped Beluga 10% Imperial Stout from De Kromme Haring, burnt yet smooth and hugely flavoursome, and Brouwerij 't Verzet's Oud Bruin, a massively sour and tart Flanders Old Brown. Of the British ales tasted, Lymm's Dam Strong Ale was lovely – malty, estery and earthy-bitter, and tasting rather lighter than its claimed 7.2%! 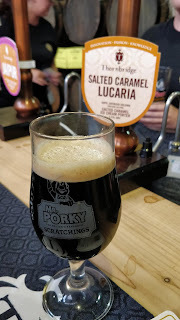 As I said, the others I tried were maybe a bit too green, with the exception of some from the Thornbridge bar, most notably their creamy-dry and hoppy Green Mountain Session IPA (keykeg-conditioned, rather than cask) and the rich and weirdly tasty Salted Caramel Lucaria Porter (right). Oh, and I also at last got to meet Ben Palmer, who writes about his experiences of being an Englishman training as a brewer in Germany on his blog Hop & Schwein. We'd chatted online – shared interests! – but not actually met before. We was there tuesday-friday, but didn't se you. Good times had by all though. Sorry I missed you. I found some Ratebeer friends (because I knew where to look!) plus a couple of others who I located via their Untappd check-ins.